Once it was certain that his Arbois restaurant had retained its two Michelin stars, held for 20 years, Jean-Paul Jeunet confirmed his retirement. He has formally handed over the business to his second-in-command Steven Naessens, who has worked with him for eight years. According to local reports, the Hotel Restaurant Jean-Paul Jeunet will be re-named Maison Jeunet. Jean-Paul Jeunet, 61, plans to travel the world, but in order to ensure continuity, he will initially continue to work with Steven Naessens, who he regards as his ‘spiritual son’. The restaurant is about to re-open after the winter break and there are some changes forecast including a rumoured return of sommelier Stéphane Planche to look after the wine list… expect even more natural wines. This is just one of several changes happening in the Arbois restaurant scene. Among them, it is thought that La Balance, another excellent restaurant, will change hands this year and the new Brasserie Aux Docks is starting to make waves. Like his father André before him, Jean-Paul Jeunet could not have been a better ambassador to the Jura wine region, which is why I chose to include the pair in second chapter of the history section of my Jura Wine book, named “The People Who Made a Difference”. This chapter gave me perhaps the most pleasure to research and write. Interviewing Jean-Paul Jeunet over coffee and delicious pastries was truly fascinating. I have also had the pleasure of eating at the restaurant several times, always enjoying inventive cuisine, attentive service and, of course, fine Jura wines. You can read more about the Jeunets including about Jean-Paul Jeunet’s wine philosophy in the following book excerpt. Imagine the scenario. You are a young and ambitious French chef with your own restaurant, already boasting a Michelin star, building yourself a fine reputation. Having twice failed to win the top chefs’ competition, you decide instead to enter the top sommeliers’ competition in the country. You’re a chef and you win . . . This is what happened in 1966 to André Jeunet, father of Jean-Paul Jeunet (at the time of writing the only two-star Michelin chef in the Jura and Franche-Comté). 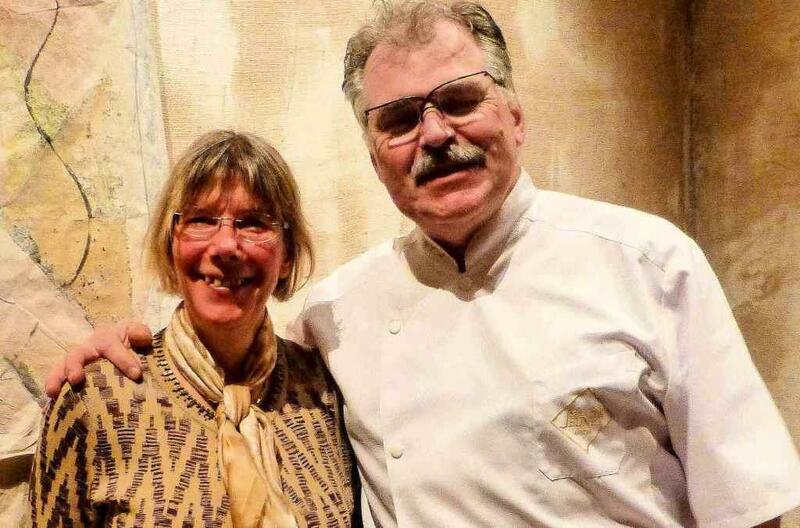 In a familiar story for most French-born chefs, André Jeunet, who came from Arbois, was inspired by his mother, who taught him about the flavours of local food and drink. Like most Jura country folk, they had some vines, made wine and used the travelling still to make home-grown fruit spirits and liqueurs – and all turned up in the cooking pot. After catering studies and work in restaurants and teaching, André married Raymonde Bonjour, the daughter of a hotelier in Port Lesnay (once the Hotel Bonjour, today the delightful Hotel d’Edgar). 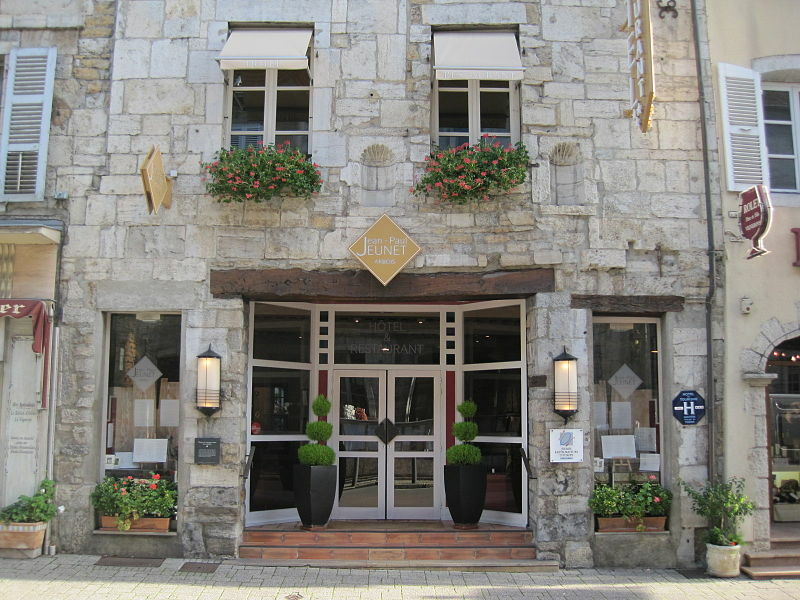 In 1951 the couple took on the task of renovating the Hotel de Paris in Arbois, then on the main road between Paris and Geneva, with the aim of turning it into a busy Routier restaurant. At that time Arbois already had two Michelin-rated restaurants (La Balance and the Hôtel des Messageries) and the story goes that the local Michelin inspector, who had heard about the Hotel de Paris, encouraged them to take down their Routier sign so that they could be eligible for a star the next year. Losing the Routier customers was a risk, but they took it and won a star in 1959. In the meantime André Jeunet supplemented his income by teaching at the girls’ catering college in nearby Poligny. Along with cookery courses he included wine-tasting courses, and would take the young ladies off to visit vineyards around the country. He was hooked on wine and learning fast. After losing France’s top chef’s competition in 1962 and 1964 to no less than the great chefs Paul Bocuse and Jean Troisgros, he gave up, but then tried for the Meilleur Sommelier de France instead. He won the award in 1966 and with that in hand he was able to indulge his passion as well as pay particular attention to the wines of his own region. It is said that whenever he travelled out of the region to another restaurant, he always took a clavelin of Vin Jaune with him to help it become known among his colleagues. This era coincided exactly with the time that a few small vignerons in the Jura were turning away from polyculture to set up wine estates, inspired partly by the fact that Henri Maire was succeeding in making Jura wines known around the world. According to Jean-Paul, his father André had respect for Henri Maire, whose estate wines in particular were very good at the time, but he wanted to help and encourage these younger vignerons. He would taste wines with Jacques Puffeney, Lucien Aviet (Caveau Bacchus) or Roger Lornet (father of Frédéric) and suggest ways that they could make their wines better, and of course he sold their wines in his restaurant. This being the era of fast improvements in cellar technologies, André encouraged the vignerons to be cautious with these new technologies, to value their land and to remain artisanal. He was an admirer of the philosophy of the Beaujolais wine merchant and natural wine advocate Jules Chauvet, who was a great influence on Pierre Overnoy. Jean-Paul Jeunet spent a lot of time as a child with his grandmother – his parents being busy establishing their hotel and restaurant – and credits her with being as big an influence on his understanding of flavours as she had been for his father. He followed his father into the business after studying in Nice and worked in the kitchens of several grand restaurants. 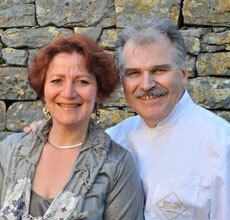 When his father became unwell in 1986, Jean-Paul and his wife Nadine took over the business. He had previously tried to work in the kitchen beside his father, but there was friction. When Jean-Paul received his second Michelin star in 1996, he finally believed he had done something good for himself, and eventually changed the name from Hotel de Paris to Hotel Restaurant Jean-Paul Jeunet. Naturally his father had taught him about the local wines, but Jean-Paul credits Stéphane Planche, who worked as the restaurant’s head sommelier from 1998 to 2009, with helping him create a strategy for the restaurant’s wine purchases and stocks, so that between 25% and 35% of all purchases are put aside to age. 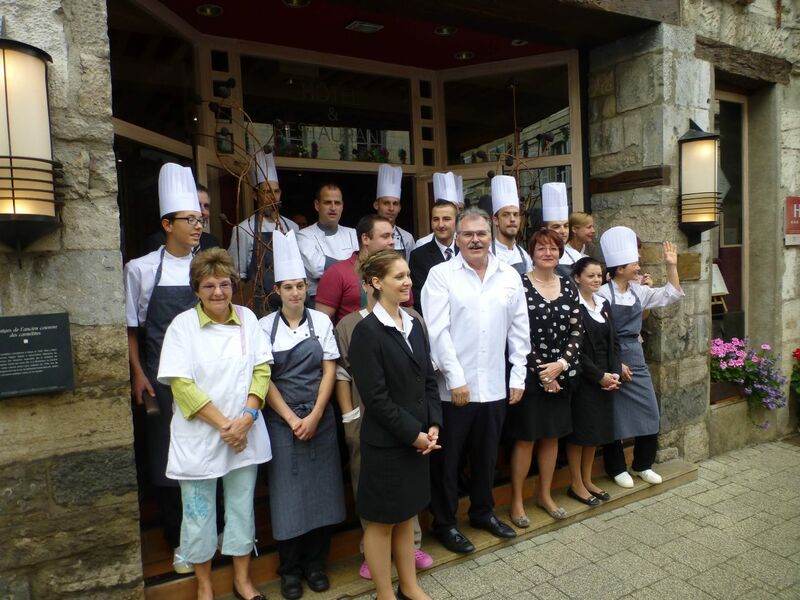 Stéphane says that the restaurant was already really driven by its excellent wine selection before his arrival, and both André (with whom he was able to spend time) and Jean-Paul taught him much about the Jura and its vignerons. Stéphane and Jean-Paul share an appreciation of wines that are simple and represent the land and their vignerons; they remain good friends and Jean-Paul helped Stéphane set up his Arbois wine shop and bar, Les Jardins de St-Vincent. Jean-Paul believes that Jura wines have made great progress in the past 20 years or so, and he is a supporter of vignerons working with organic and biodynamic methods in particular. He believes in minimal intervention and seems to love the new fruity styles of reds that give pleasure without tannin and encourage one to drink a second glass. However, he fears that the real extremists may lose the Jura some clientele, and doesn’t enjoy some of the really ‘crazy’ wines. Restraint in purchases should be assured by the sommelier since 2010, Alain Guillou, who was awarded Sommelier of the Year by the publisher Gault et Millau in 2013. Currently their list has 640 wines, including over 350 from the Jura. On matching Jura wines with food, Jean-Paul starts with the comment that God must have been from the Jura to create such a divine marriage as Comté cheese with Vin Jaune. He also believes that the matches of basic local products like Morteau sausage with Poulsard or pike with Savagnin are essential, but he goes further: ‘Give me a wine and I will give you a dish to match,’ he says, and rates lobster with Savagnin a splendid marriage, though he refuses to be drawn into discussions about whether to choose ouillé or an oxidative version, believing each wine should be treated on its own merits without going too far into how it was made. For Jean-Paul the terroir (in which he includes the grape varieties) counts for 51% of the character of a wine, and the know-how and work of the vigneron for 49%. What’s more, if you do not understand the fundamentals of that terroir, you can’t begin to make a good wine, he claims. Today the restaurant’s cuisine is influenced by the greenness of the Jura and its soil, using many root vegetables – simple wines of the earth go well with these dishes, Jean-Paul says. According to Jean-Paul, both he and his father transmitted into their cuisine their own history and traditions, and these match the originality and history of the grape varieties and terroirs of Jura wines. Both men of strong personality, Jean-Paul believes that their individual and highly flavoured cuisine can bring out the best in Jura wines because their flavours are so powerful. Jean-Paul Jeunet is regularly seen at wine events, and sometimes agrees to be one of the chefs for grand PR occasions as well as contributing recipes to the CIVJ’s publications. He continues to be a great supporter of local vignerons, both established and new, and to be excited by their wines. Very approachable, he puts a smile on younger growers’ faces when he – always in conjunction with his sommelier – agrees to list one of their wines, often discovered by himself at a tasting. The Jeunet dynasty has been important for Jura wines, providing a focal point for lovers of gastronomy. And for those who have loved the wines from a distance and visit Arbois for the first time, the Restaurant Jean-Paul Jeunet has become a place of pilgrimage. Fortunately the prices, relative to its status, have been held in check both for the food and the wines, as befits this region. The above was an excerpt from Wink Lorch’s award-winning Jura Wine Book, available in print from Wine Travel Media and available as an eBook on iBooks and on Kindle.